As a freelance graphic designer working for myself I’ve been able to lower my overhead and increase creativity. I bring the experience of a large agency with the cost of an individual working from a home office. I’m happy working on jobs ranging from graphic production to high end creative concepting and branding. I’m currently serving creativity to the West Coast, including; Los Angeles, San Francisco, Sacramento and looking forward to adding clients from my new home town of Portland. As the Director of Creative Services for one of Sacramento’s leading advertising agencies, it was my responsibility to design, oversee, and facilitate the creative process. I helped develop this small eight-person agency into a highly reputable forty-plus employee creative force. At Augustine I was able to work on both national and local accounts, including clients such as Safeway, Kroger, Lennar Homes, D.R.Horton, Parts Planet, the Chilean Avocado Board and many more. As a Senior Designer for Digital Brewing Co., a successful interactive firm in the heart of San Francisco, I had the opportunity to lead, develop and execute on several large scale interactive and branding projects. Digital Brewing Company produced nothing but award winning work for architects, engineers and toy companies, including Wild Planet Toys, Tangle Toys, EDAW, Glumac International, Instill Corporation and many more. As a designer for Hunt Weber Clark & Assoc., I was able to learn all aspects of the trade, from client services and creative briefs to vendor and production management. 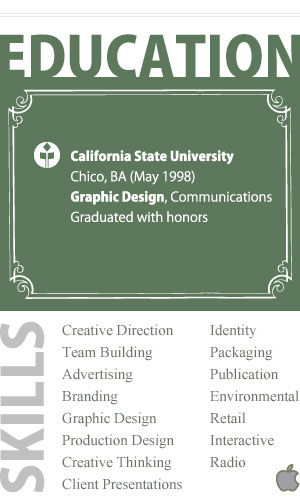 Because of my creative skills and developing expertise, I was promoted to Art Director/Team Leader within two years. I gained a variety of experience in the hotel industry, the toy industry and in theater advertising with companies such as Kimpton Group, Galoob Toys, University Games, and Beach Blanket Babylon.